Auction #1040 Lots Posted. Browse & Bid Now! 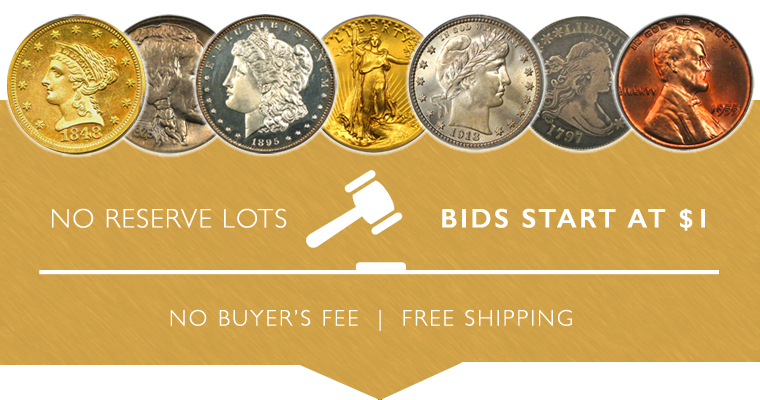 Our Sunday Internet Auction #1040 offers a fantastic selection of 348 New Items, along with 40 Special No Reserve lots and 25 Vault Value items. It also features Part 5 of The Creole Collection. Wow! Another great offering from the Creole Collection is now available in Sunday Internet Auction #1040. Only 27 power-packed pieces are up for bid this time. Highlights include a beautifully toned <a href=https://www.davidlawrence.com/product/1659334" style="color:purple">1850-O $1 NGC MS61, a key date 1884-S $1 PCGS MS61, a finest graded 1859 2 1/2 PCGS Proof 65 DCAM, a finest graded 1868 2 1/2 PCGS Proof 65 CAM and a gorgeous 1900 $10 PCSG Proof 64 CAM. All lots will begin closing at 8pm EST on Sunday, November 25th, so be sure to browse and bid early on these selections! 1859 2 1/2 PCGS Proof 65 DCAM (New Reverse) ex: Amon G. Carter, Jr.
Our first highlight is a 1904 1c PCGS MS67 RD. This piece has gorgeous red-orange colors with amazing overall eye appeal. It is a beautiful superb gem that has been bested by no other examples of the date. This week's second highlight is a 1921-S 50c NGC MS65. The coin is the key to the Walker set in most grades from VG-MS64. MS65s of this date are seldom offered, and this piece is all there. It is a lovely gem with a light golden patina and a hint of rose near the rims. The luster and strike are exactly what you'd expect (and want!) from the date. Of course there are many other highlights, so be sure to browse all lots in this exciting new sale before it closes on Sunday, November 25th.